Re:: Any one else going? As a sort of early birthday present to myself, I'm running the Single Cab over to the Sacramento Bugorama #74 on the 30th of this month. I plan to check things out and put the SC in the car show the next day, Sunday the 31st. 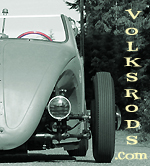 I'll be wearing a Volksrods t-shirt. The SC is a couple shades of blue with some recent primer, a modified Volksrods hood ornament on the roof and one of the few with a V8 behind the cab.